Earlier this week, I suffered an immense tragedy. Not only did I break one nail, but two. And on my left hand, no less (which my pal Marisa refers to as "the trophy hand" Haha!). So, with nothing left but little nubs on my middle and ring fingers, I was a sad sack. But then I spotted my loose holo diamonds, courtesy of a super sweet friend, and instantly, I felt better. Because glitter can make any situation better. It's, like, science. Haha! Deciding just what to do with the diamonds took some thought, but then I came up with a super fun idea that used one of my current obsessions Plur-ple, from the China Glaze Electric Nights Collection. First, I laid out the "petals" without using any polish, to make sure they'd fit. Once they were even, I brushed them off to add some bonding polish (the same I used when applying studs) using a very small dotting tool. Then, I used tweezers to apply the diamonds, pushing down with my finger to make sure they were secure. I repeated the technique until all the diamonds were stuck, finishing off with a few dots of At Vase Value, for the middle of the flowers, and to fill in the rest of the nail. When that was dry, I added two more coats of top coat, to seal the edges of each diamond. Trying to get a good picture of this mani took forever, and they're still a little soft. But that's because my lens couldn't focus on the ridiculous shine. I can't even handle how much I love this mani. It's basically everything I look for: bright, vibrant colours and a ton of sparkle. Haha! This was my first time working with loose glitter and I've fallen in love. Usually, I pick out pieces from bottles of polish, but that means I have to be exact with placement, or it gets all goopy. With loose pieces, though, the sky's the limit! YAY FOR LOOSE GLITTER! Haha! Did you have bright and shiny nails this week? Link up and show 'em off! Have an awesomely fantastic weekend! Glitter definitely solves everything lol especially with nails. Your nails still look beautiful! Sorry to hear you broke 2 nails this week. Gotta love how glitter fixes everything. I can't even stand how much I love this! It's totally IS science! I'm not a glitter fan, per se, but I'm definitely a sparkle fan...and that mani has so much sparkle it makes me happy down to the dark recesses of my soul. 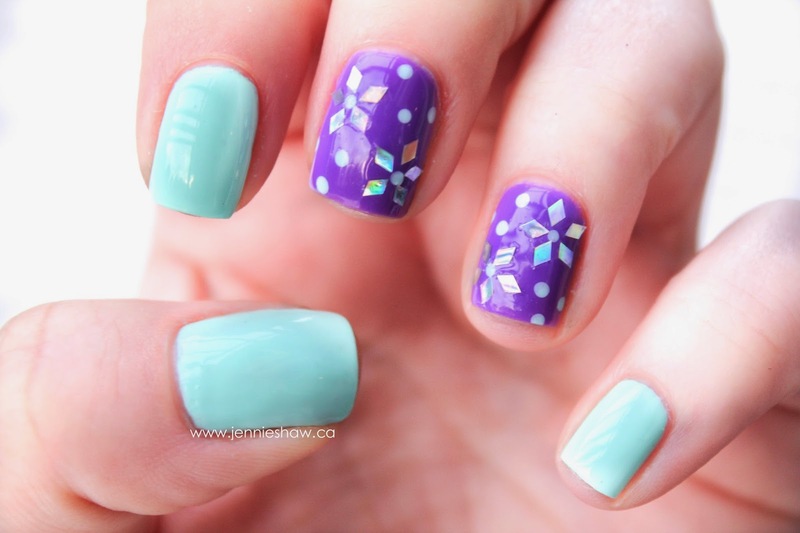 I LOVE how you used those diamond holos. 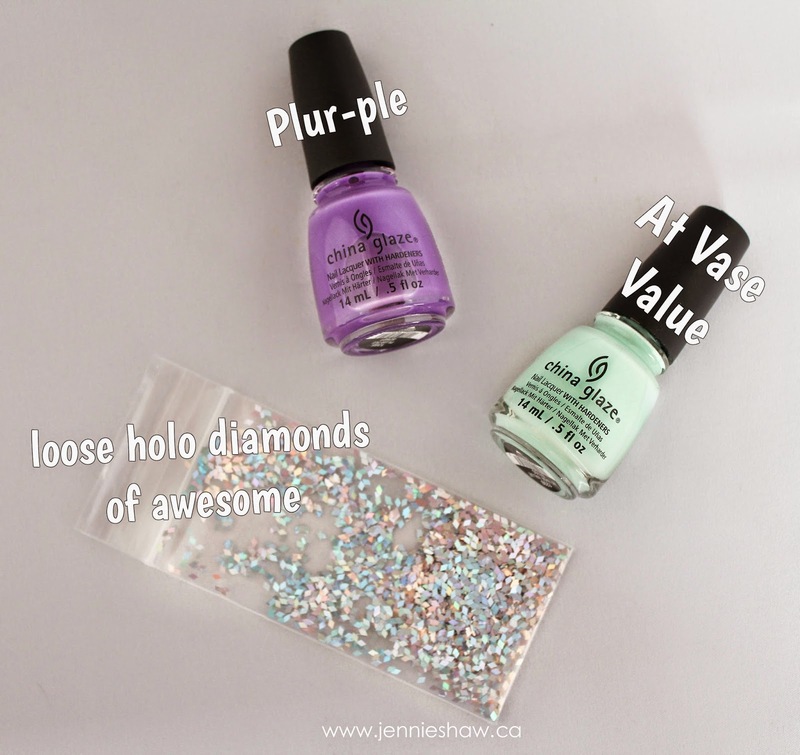 If the Spring thaw isn't going to happen based on Mother Nature's schedule, Jennie is going to make it happen with the power of her awesome Spring nails. YES.